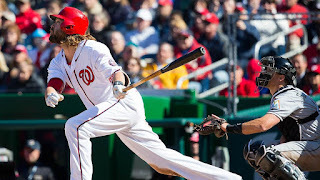 Jayson Werth drove in the go-ahead run with his first hit of the season and Clint Robinson followed with a two-run single as part of a three-run seventh inning to give the Nationals a 4-2 victory over the Marlins on Sunday at Nationals Park. Both teams scored in the first inning after RBIs from their superstar right fielders, Giancarlo Stanton and Bryce Harper, before both starting pitchers settled in. Marlins left-hander Tom Koehler allowed eight hits and issued four walks, but he kept the Nationals from scoring again until the seventh, while right-hander Joe Ross kept the Marlins lineup off the board for the rest of his outing. 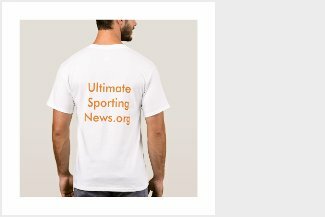 "Edwin [Jackson], he gets two quick strikes on Werth, and he's not able to put him away," Marlins manager Don Mattingly said. "He gets [Wilson] Ramos to pop up, and gets Clint two strikes, and is not able to polish him off, either." The Marlins added a run in the ninth inning, when outfielder Christian Yelich hit a solo home run off Nationals closer Jonathan Papelbon, who has a save in all three of Washington's victories this season. Werth breaks slump: With the bases loaded in the seventh inning, and in the midst of an 0-for-13 slump to start the year, Werth delivered his first hit of the season at a crucial time for the Nationals, dropping a single into right-center field to break the tie. Robinson added a two-run single later in the inning to extend Washington's lead to 4-1. Gordon caught stealing: The Marlins had a chance to get a threat going in the sixth inning when Dee Gordon, who tripled to open the game, singled to open the sixth inning of a 1-1 game. But with Marcell Ozuna at the plate, Ross paid close attention to the speedy Gordon, who has paced MLB in steals the past two years. Three times Ross made pickoff attempts to first. Held close to the bag, Gordon didn't have a particularly long lead, but he still tried to steal second. Catcher Wilson Ramos made a strong throw to shortstop Danny Espinosa, and Gordon was out by a wide margin. On the season, Gordon is now 0-for-2 in steal attempts. "That was huge in that situation," Ross said. "Because once he gets on, he could be on third within two pitches, so that was big." Strong start from Ross: It had been eight days since Ross made his last start, in an exhibition game last Saturday here against the Twins. From the end of Spring Training and including Saturday's rainout, Ross has so regularly been the victim of rainouts and delays that manager Dusty Baker joked with him that it always rains when he's supposed to pitch. After allowing a run in the first inning, Ross settled down to retire 10 of the next 11 batters. He held the Marlins to one run on five hits in seven innings with five strikeouts. "Damage control is the key, especially for a young pitcher, and after [the first inning], he was masterful," Baker said. "He had quite a few 3-2 counts there, but a couple double plays got him out of trouble, and he made some pitches when he had to make them." "The game appears slow to Joe anyway. He's 22, but he comes from a great family; his brother has been in pro ball for a while. He knows what he's doing, and he's not intimidated by any situation." Realmuto nabs Harper: Just as the first inning was beginning to snowball on Koehler, the right-hander received a boost from his catcher, J.T. Realmuto. 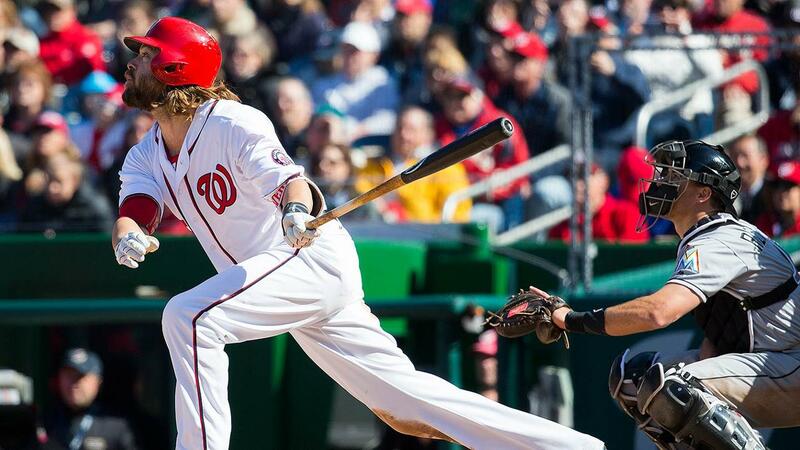 After Harper's RBI double andDaniel Murphy's walk, Koehler bounced a pitch to Werth. Seeing the ball in the dirt, Harper took off toward third, but Realmuto retrieved the ball and threw Harper out at third base for the second out. Koehler got out of the jam when Ramos grounded into a forceout, limiting Washington to one run. "That's huge. That's a big out," Koehler said. "If he doesn't get that out, they have a guy on third there, and the whole complexion of the inning, who knows where it goes from there. That was kind of a momentum stopper by J.T., to make such a good play." The Marlins lost their challenge in the fifth inning on Daniel Murphy's infield single, on a liner that popped out of the glove of first baseman Justin Bour. The ball bounced to Gordon, who flipped to Bour, who arrived at first at the same time as Murphy. After a review of one minute and 42 seconds, the safe call stood. Marlins: The Marlins head to Citi Field for a three-game series with the Mets, beginning at 7:10 p.m. ET Monday. Jarred Cosart will make his season debut for Miami. The right-hander was initially set to start on Sunday, but Saturday's postponement pushed him back a day. New York counters with lefty Steven Matz, who also will pitch for the first time this year. Matz was 4-0 with a 2.27 ERA as a rookie. Nationals: Max Scherzer will make his second start of the season against the Braves when the Nationals host Atlanta on Monday at 7:05 p.m. ET at Nationals Park. Scherzer yielded a pair of solo home runs through seven innings with seven strikeouts on Opening Day at Turner Field. Bud Norris will start for the Braves.